Basement floods are devastating to home owners. Not only can it damage or ruin personal items that are stored in the basement, but water restoration following a flood can be time consuming and expensive, especially if you try to do it yourself. If not done correctly, mold will form, causing additional damage to your home and pose a serious health risk for everyone living there. The best approach to addressing basement floods is preventing them from happening in the first place. Here are some things you can do in and around your home to keep your basement dry. Basement flooding is often the result of problems outside that redirects water toward the house and/or makes it easier for water to permeate through foundation walls. Fortunately, these problems are often remedied through periodic property maintenance. Each season, clear gutters and downspouts of leaves and debris so water drains properly during heavy rains. Also, make sure that downspouts are tied into the existing sewer system or that they drain at least 6 feet from the foundation of your home. This will prevent water from pooling against your home. Building up landscaping beds or re-grading low areas will also keep water from flowing toward your home. Indoors, perform regular checks on your sump pump, floor drains, wash machine, and other areas of your basement that are likely to cause flooding. Often, something as simple as a faulty hose or a clogged drain can be the catalyst for flooding. If your basement has low spots, consider placing inexpensive moisture alarms there to alert you if water begins to pool. Finally, seal wall cracks and any gaps around doors or windows. 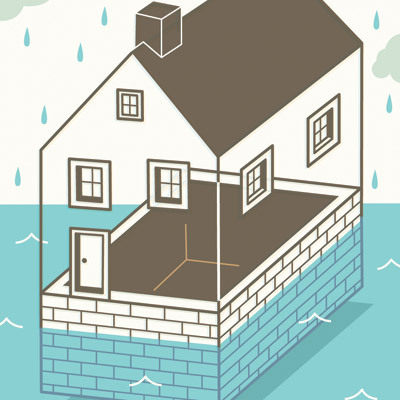 Every home is at risk of a basement flood, even if there is not a history of frequent flooding. If you find yourself underwater, we can help. Contact us to learn about professional water restoration services that will safely and effectively get your basement cleaned up! Clean USA has 2 conveniently located offices in Illinois to help better serve our growing list of customers.